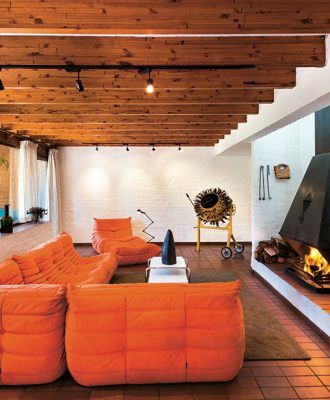 This contemporary suburban home offers open-plan living at its unadorned best. 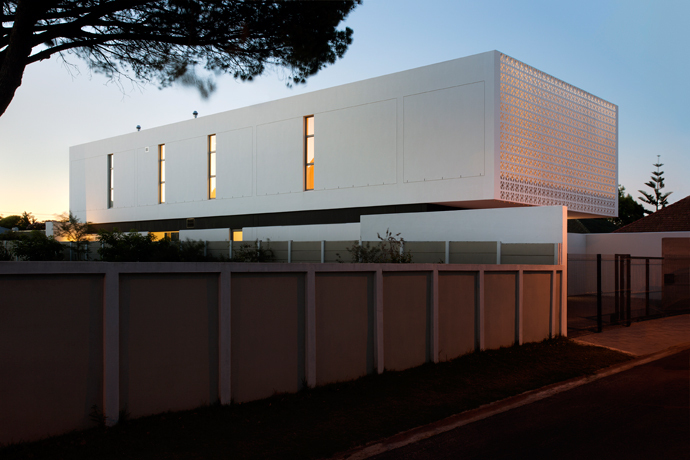 Rondebosch, a Cape Town suburb with a distinctly colonial air, is not the neighbourhood one would expect to find cutting-edge architectural design, so the first glimpse of this ultramodern structure comes as something of a surprise. Designed for a young family, the house offers relaxed living and is ideally suited to the South African indoor-outdoor lifestyle. 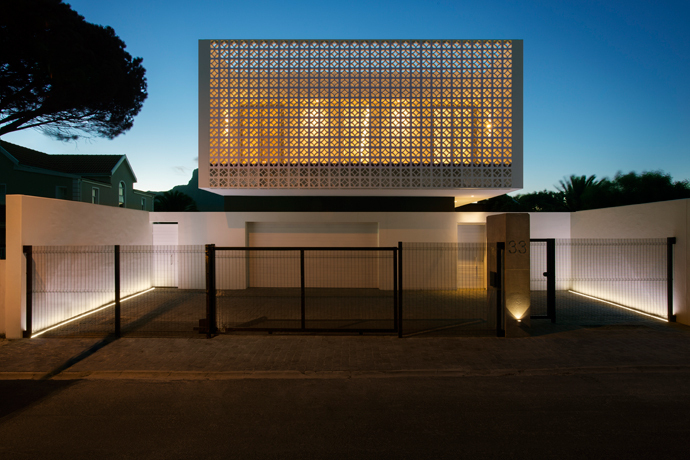 In a nod to decades-old construction elements used extensively in the area, the architects used standard precast concrete breeze blocks in the construction of a striking screen wall that acts as the “face” of the dwelling. 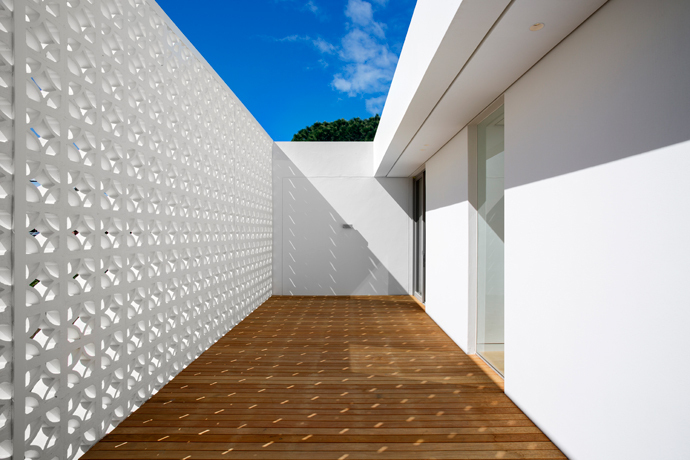 “It allows light to permeate while providing privacy and dappled light to the guest wing and terrace,” say the Three14 Architects design team of Kim Benatar, Sian Fisher and Miles Appelgryn. “The client’s brief called for a contemporary, open-plan home that offers a relaxed lifestyle and takes advantage of the site and the views.” The design ticks all those boxes and more. 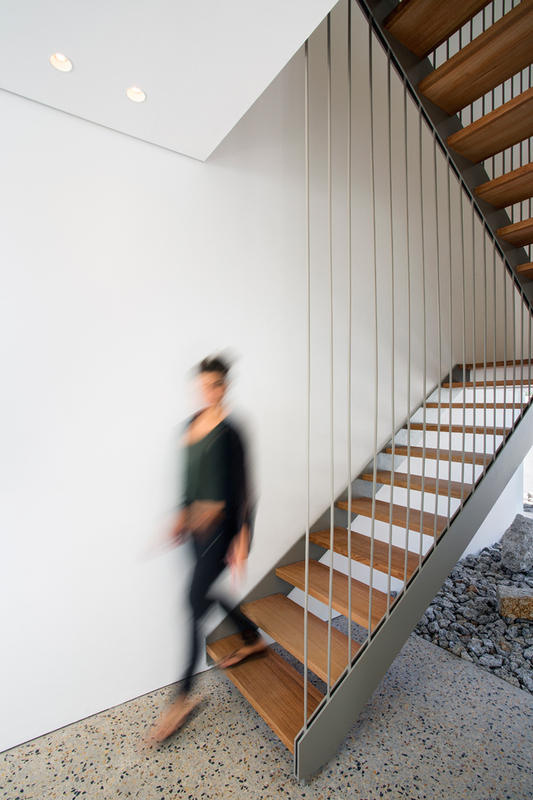 The first floor consists of bedroom accommodation, taking the form of a minimal white box that hovers over the living spaces on the ground floor. 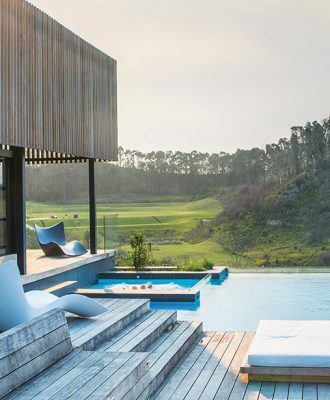 Strategic openings in the box make the most of views of Devil’s Peak and the broader Table Mountain range, while maximising exposure to light. At ground level, a central courtyard adjacent to the kitchen and dining room creates a focal point, complete with the dramatic screen wall, which creates an open-air terrace for the guest wing of the house, offering privacy from the street and allowing views and light to permeate. The main gathering spaces in the home, both at ground level and upstairs, open onto the courtyard, which ties the spaces together vertically. 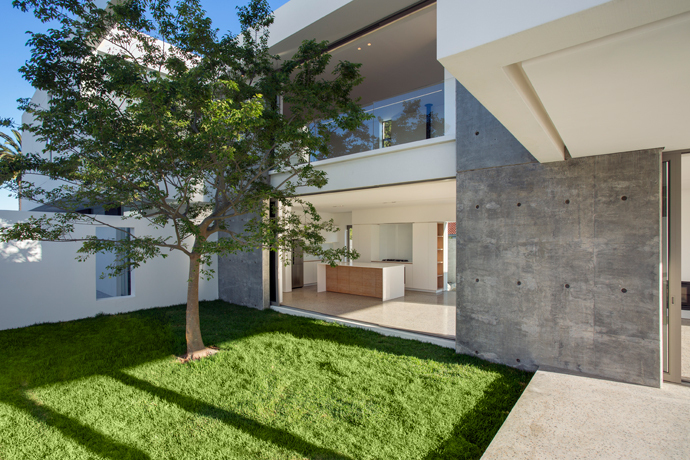 The courtyard was built to accommodate a large focal tree, the canopy of which allows dappled light to filter into the living spaces without compromising on privacy. It is one of the design’s success stories. 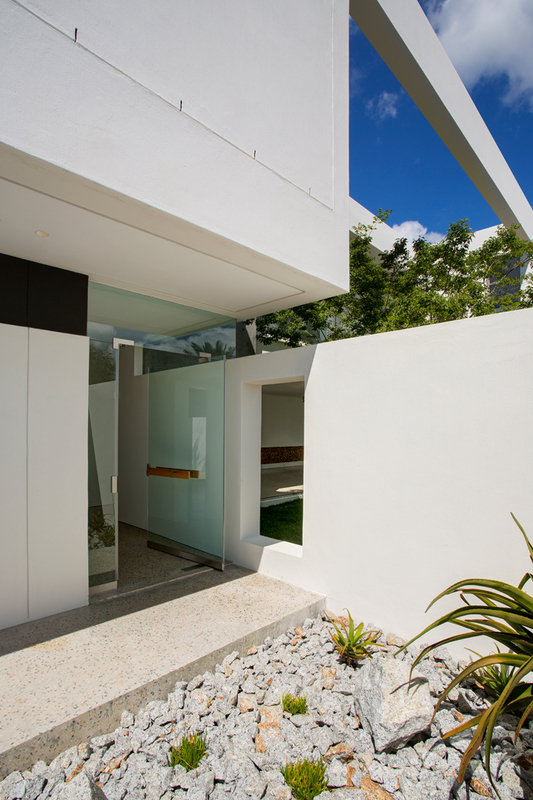 Another success story is the wall that forms the back edge of the open-plan living space. 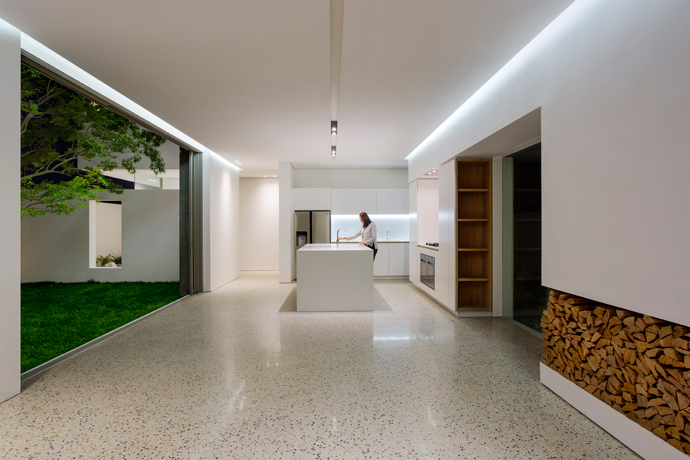 Housing functional living necessities such as a fireplace and the kitchen cooking zone, the wall was conceived as a continuous element, stretching across the entire space and strengthening the open-plan arrangement. The result is a marriage of true minds. 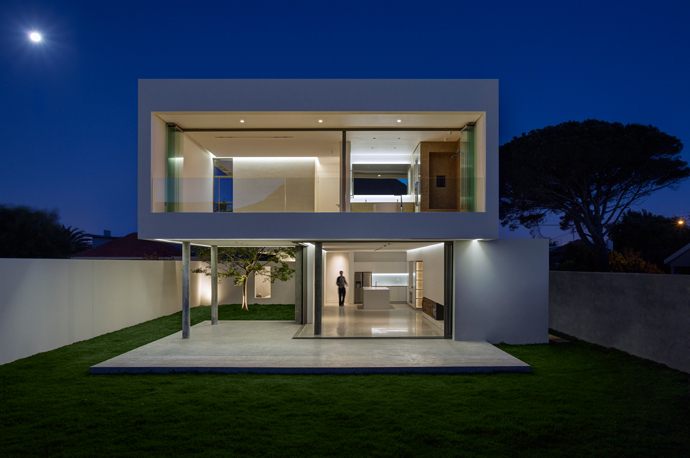 Open-plan living areas devoid of decorative features and fiddly finishes rely on large expanses of glass to blur the boundaries between inside and outside spaces, making this home perfect for the South African climate and the young family that calls it home.